Since three brave girl students of NCLP Purulia, namely Afsana Khatun, Sunita Mahato & Rekha Kalindi were invited by Her Excellency the President of India to Rashtrapati Bhavan on 14th May, 2009 in recognition to their courageous stand against child marriage, the movement against child marriage, which was initiated in early 2008, has gathered momentum through out the district of Purulia. Many brave girls came forward to say NO to their settled child marriage. Almost all these girls cherished a common dream: to receive blessings from Her Excellency the President of India at Rashtrapati Bhavan. 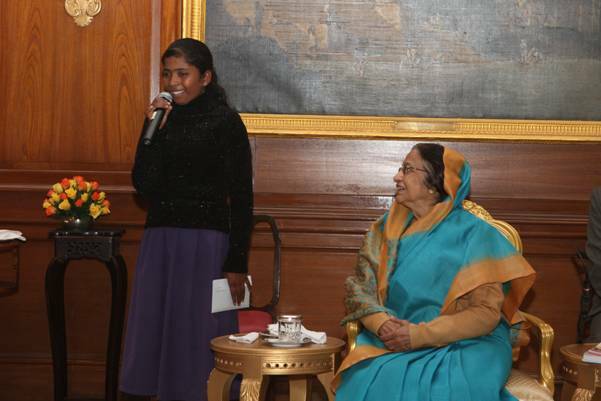 When Her Excellency came to know about the achievement of these brave girls of Purulia to resist child marriages and about their long cherished dreams, She again kindly invited three of these girls to meet them in Rashtrapati Bhavan. From the office of the President of India it was also suggested that the girls who previously visited Rashtrapati Bhavan in May 2009, may also come to meet the President, if they are able and willing. Accordingly, a team of five brave girls, associated with NCLP Purulia, namely, Bina Kalindi of Bagmundi Block, Mukti Majhi of Arsha Block, Sangita Bauri of Purulia-1 Block, Afsana Khatun of Purulia Municipality, and Sunita Mahato of Joypur Block along with father of Mukti Majhi, mother of Bina Kalindi and father of Sangita Bauri visited Rashtrapati Bhavan on 7th December, 2011. Afsana Khatun and Sunita Mahato, who were in Rashtrapati Bhavan on 14th May, 2009, also accompanied this team. Shri Avanindra Singh,IAS, District Magistrate & Collector, Purulia led the team and he was assisted by Shri Prosenjit Kundu, Asstt. Labour Commissioner & Project Director, National Child Labour Project (NCLP), Purulia. On 7th December, at about 10 AM the team reached Rashtrapati Bhavan and at first they were greeted with a guided tour to the various historic halls & galleries of Rashtrapati Bhavan.Shri Bhaskar Khulbe,IAS,Principal Resident Commissioner, Government of West Bengal, and Ms Karin Hulshof, country representative of UNICEF, India, joined the team before the meeting of the team with her Excellency the President of India. The programme begins with the introductory note by Shri Bhaskar Khulbe, Principal Resident Commissioner, Govt of West Bengal. In his speach, the Principal resident Commissioner expressed gratitude to Her Excellency for graciously granting the opprrunity to the five brave girls from Purulia, to be present before Her Excellency. He then briefly introduced five girls and Ms Karin Hulshof and requested Shri Avanindra Singh, District Magistrate, Purulia to present the mission which has enabled these five girls to visit Rashtrapati Bhavan. The District Magistrate of Purulia, Shri Avanindra Singh, IAS, thanked Her Excellency, the President of India, for inviting the brave girls of Purulia District to Rashtrapati Bhavan for showering her blessings. He stated that the Social movement against child marriage which was started in Purulia, in year 2008, got real momentum only after getting blessings from Her Excellency in May 2009. Today, Bina Kalindi, Sangita Bauri & Mukti Majhi are becoming Torch Bearers of this movement and have become icon of Women Empowerment to decide not only their own destiny but the destiny of millions of girl children in rural India. These girls are addressing community meetings for evolving public opinions against child marriage in our state. The Government of West Bengal has consulted such eleven girls in the process of formulating State Plan for Prevention of Child Marriage. After getting inspired from the noble initiatives from the President's office, a technical mission on this issue has been set up with the valuable support from the UNICEF, who has been a responsible partner throughout this journey. He expressed sincere thanks to UNICEF. He stated that under "Child Activist Initiative" and through various workshops and training through National Child Labour Project Schools, focus is made upon forming the public opinion against child labour, child abuse and child migration and developing leadership qualities, power of expression and problem solving skills among these girls. So far 62 girl students, from different NCLP schools, whose parents decided to marry them off at an early age, prevented their child marriage collectively with the active participation of the community and the peers. He ended his speech by thanking Her Excellency, for Her kind help and blessings in the journey towards making a child marriage free India. The girls then presented some mementos of handicraft items of the district like the Chhau Mask of Goddess Durga, Lord Ganesh, a pair of tribal faces, some lac bangles and a fish made of lac, to Her Excellency. Prosenjit Kundu, ALC Purulia briefly introduced each girl to the President. The President patted each of the girls for their courage. She kindly stood side by side with the girls and raised their hands high. 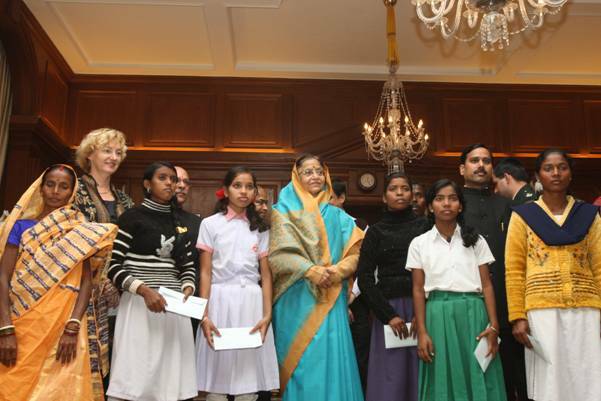 Her Excellency then gifted each of the girls with Rs 10,000. 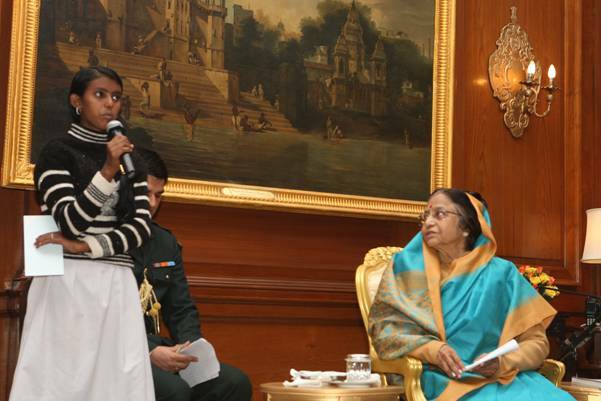 Sangita Bauri, the brave girl from Lagda village of Purulia District said before the Hon'ble President of India that she never imagined that she would ever be able to meet and personally talk with Her Excellency, The President of India. She said that she was feeling nervous as she never have been to Delhi before. She was overjoyed that The President Herself called, met and blessed such an ordinary girl like her. She told that she would never forget that day. She expressed her deep desire to be blessed by Her Excellency, so that she would go far ahead in her life and perform her duties towards the country. 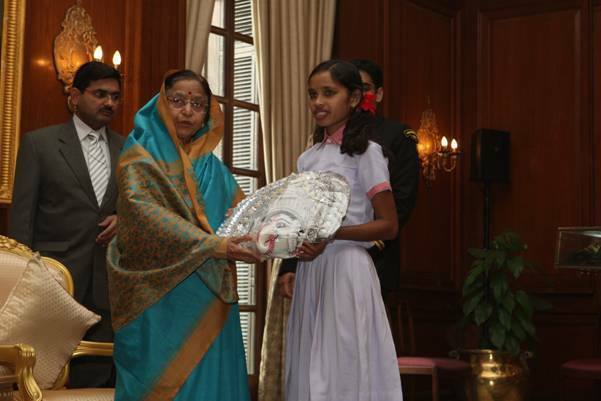 Afsana Khatun, the brave girl from Purulia Municipality, who was invited by Her Excellency in May, 2009 also, expressed her gratitude for providing her with second chance to take blessings from Her Excellency, The President of India. She also expressed her concern for other brave girls so that they too get an opportunity to receive blessings from Her Excellency, and get a motivation to move ahead in their life. She said that she along with other peer brave girls is working on the propagation of anti-child marriage agenda so that no one is married before attaining 18 years of age. Her Excellency the President, in her speech, while addressing, said that she was very happy that Sri Bhaskar Khulbe, Principal Resident Commissioner, West Bengal, Sri Avanindra Singh, District Magistrate, Purulia, the accompanying assisting team present along with him, Bina Kalindi, Mukti Majhi, Sangita Bauri, Afsana Khatun, Sunita Mahato & their parents and the Representatives from UNICEF have come to Rashtrapati Bhavan. She said that the courage that these girls have shown is a very big matter because it would not only be advantageous to them but it would also provide great courage and a path to walk on, to all those girls who would be pressurized to get married before 18 years of age. She advised the girls to educate & upgrade themselves which will provide courage to them, which is very essential for the country. Our Country is progressing financially and physically. The name and fame of our country is spreading worldwide. But with only financial and physical progress everything is not achieved. If we want to make the life of our people happy, we have to remove the ill-traditions, ill-practices, and the misunderstandings of people. No parents ever want anything bad for their children. But due to traditional superstition and ignorance they are supporting child marriage. The Government has introduced many schemes for the purpose of educating the girls along with the boys, like Sarva Sikshya Aviyan, so that no girl or boy is left out of school. But if the parents do not cooperate then it would not work smoothly. So it is equally necessary to train the parents and to bring a consciousness among the parents, so they understand the value of children's education. Otherwise, situations will be that girls at very small age, say at 12, 13 or14 years, will get married and become mother, when they are still a child. Then they will have to take care of themselves and take care of the baby. Then after each consecutive year they give birth to babies, ultimately the heath of the girls fall. It increases poverty, infant mortality rate and the death rate of mothers. These are few of the dangers associated with child marriage and there are many, which have to be made understood to the parents, friends, villagers, neighours, relatives, etc. Her Excellency also appreciated the officers who have taken a great deal of interest in the progress of this work against child marriage. Hon'ble President said that when she first read in the newspaper and Smt. Archana Dutta told her that these things were happening, and how girls have shown their courage, She called them to Delhi and blessed them. This incident was widely spread through newspapers, and everyone came to know that this evil was happening which created courage and awareness in the society. She congratulated the girls that they have understood their responsibilities, stood on their feet and have created their own place in the society. Their self confidence will increase the self-confidence of other girls. She is very happy that UNICEF has appreciated and recognized this. It does not matter how much the country progresses but until the society has these evil practices & evil traditions, we cannot call it the prosperity of the nation in a right sense. She appreciated the officers for educating these girls according to Child Labour Act, through NCLP Schools. She also said the officers to generate awareness through these girls and to take them to villages during their vacations and conduct awareness camps. As these girls speak very well, so their speeches must be kept in public. She quoted that "God helps those who help themselves" and advised the girls to help themselves so that God and everyone will help them. She encouraged the girls by saying that they are all the leaders of the nation now, and they have to carry this 'Mashal' and go forward. Because of which an awakening will be created in the society and the society will awake. There are many other societies where all these evil- traditions are prevalent, so they must be educated and trained. She appreciated that Bina Kalindi, by continuous efforts, has stopped the alcohol drinking habit of her father. So the girls should also try to remove all the ill-practices of the society, so that the society will be happy and contended. She calls these girls as "the light of hope" and the torch bearers of our nation. She calls upon them to walk with Mashals as a great responsibility of the nation has come upon them i.e to make the nation prosperous in real sense. She ended her speech by giving a lots of good wishes to them and thanking everyone.